Of course there's a story to hear and it's one which conveys the plight of the farmer. On a sunny afternoon in rural New South Wales, Australia, I see before me a sight. 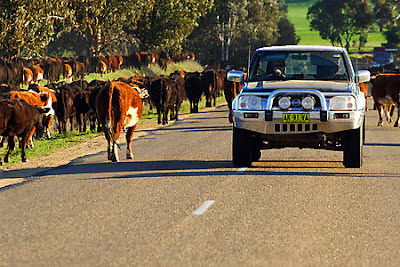 750 head of cattle being driven along the Henry Lawson Way between Young and Grenfell is a mighty feat for a bloke and his three kelpies – especially given they’ve been on the road continuously for 14 months. 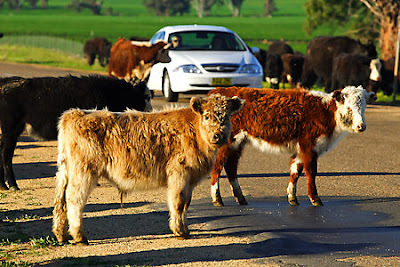 Some cattle had died and some had even joined the herd. The dedication to make a dollar is incentive for farmers to keep pressing on in such trying times. Drought is taking its toll on stock and on lives. Wives leave their men and families are ripped apart. Blokes are killing themselves because they see no hope. The statistics are shocking. 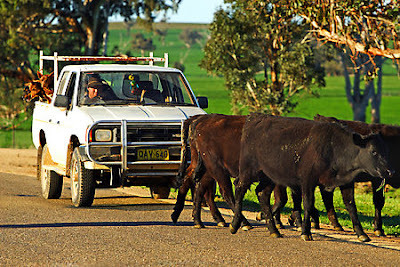 Spare a moment to think about a bloke who travels hundreds of miles guiding cattle along a road. Spare a moment to think of those farmers and their families who know nothing but struggle when their paddocks turn to dust. Spare a moment to think how lucky you are to be living comfortably in the city, while those out in the field are doing the hard yakka to grow the tasty tucker for your plate. Many people in rural Australia are killing themselves because they've lost hope. It's rare to hear about the heart-wrenching stories here in the big smoke. Thank you to Rebecca Ingram from Cobar, New South Wales, Australia for relating some shocking stories to me during my recent journey into rural and outback New South Wales.